Don’t let chronic absenteeism hurt your business! Get a better understanding of the typical reasons behind unnecessary time off, why it matters and the steps you can take to prevent it. 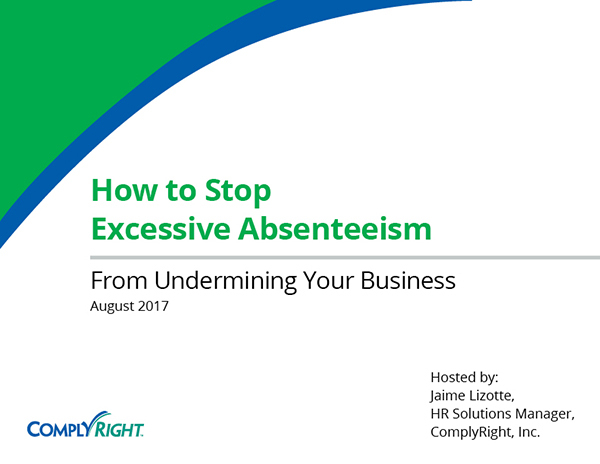 In our post-webinar Q&A Session, Jaime Lizotte, HR Solutions Manager, answers your questions on how to keep employee absenteeism from getting out of hand. Our organization has unlimited PTO; meaning, we have unlimited sick days, vacation days and flexible work from home. Our organization is growing rapidly — what would be the biggest con of having unlimited PTO for a growing organization? The first thing that comes to mind is the cost. This is paid time off, so there is an expense related to that. You are paying employees not to work. It’s one thing to be generous and offer 20 or 30 days a year, but you need to put a limit on it. Another consideration is fairness. If you don’t have a limit, some employees will take advantage of it more than others, and this can affect morale as well as productivity in your company. With the changes in many states of having a paid sick pay, I am assuming we cannot roll that time into a PTO policy, and we would need to separate those buckets? In most cases, you can roll the statutory paid sick time into your PTO policy. In other words, you need your PTO policy to offer at least the minimum amount of days required by law. And for those days, which should be the first ones used — for example, if the law requires five sick days, but your PTO policy allows 10 sick days, for the first five sick days you need to follow all rules regarding the law and how the employee should be paid. For the additional days after the five (which is just an example) these days can follow your company policy. So the bottom line is, you can roll them in to your PTO policy, but you have to, at a minimum, follow the law for the amount of days earned by the law; however you can go above and beyond that for additional days. Is PTO considered earned hours, meaning at termination are those hours required to be paid out at termination, like vacation hours earned are? This depends entirely on state law. Some states consider PTO earned wages; in other states, you can force employees to forfeit unused PTO upon termination, so it all depends on the state. And just as I mentioned in the webinar, it’s very important that you understand not only the federal but also your state-specific laws. Is there any law around not asking to show proof for any of the protected absences? In most cases, the laws do allow you to request proof. For example, under FMLA you can request proof of a serious health condition for the employee or even proof of a legal relationship of a family member, if an employee is caring for a sick family member. You can also, under jury duty laws, request proof of jury duty service. Of course, there are exceptions, and each law is different. You also want to be consistent across the board, though; if you ask for proof from one employee, you should ask for proof from all employees. I’m aware of time off for donating an organ or bone marrow, but not donating blood. Please elaborate. I am going to include school-related activities in this question, because that was also asked. Protected absences for donating an organ, bone marrow, or donating blood, as well as school-related activities all depend entirely on state and local law. They are not a federal requirement, so it depends where you operate your business. And once again, I am going to repeat that it’s very important that you understand not only the federal, but also your state-specific laws, so you know what laws your company needs to abide by. How do you handle a good employee who has attendance issues because of recurring court dates? First of all, a lot of court dates are protected by law. There are a growing number of state and local laws that protect employee absences relating to any court proceedings for domestic violence or sexual abuse. 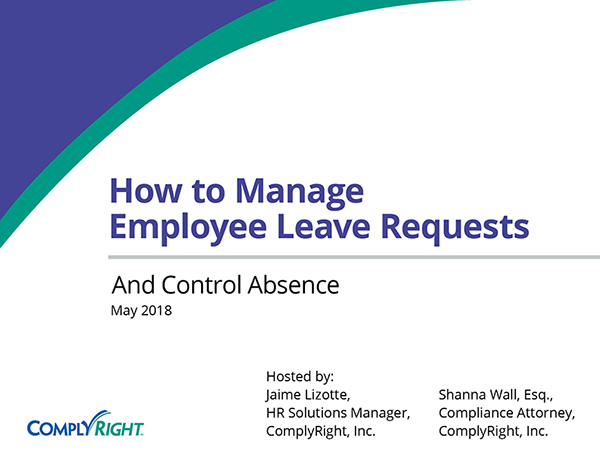 Even if the absences are not protected by law, this is an area where you would probably want to be lenient, especially for a good employee and work with him/her to get as much advance notice as possible. What are examples of consequences for policy violations? As I mentioned in the webinar, you want to leave this open to management discretion, because it really depends on the circumstances. For example, if it’s repeated tardiness, you may want to use progressive discipline, where you write the employee up and give a final warning for additional occurrences and ultimately terminate the employee if the pattern repeats itself. Now, if it’s one-time occurrence, it still might warrant termination, though, like if it’s job abandonment, with a no-call no-show for consecutive days. But, just keep in mind, before you discipline an employee, even if it’s just a write-up, that you are not penalizing him/her for any legally protected absences.